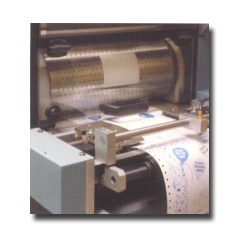 Produce integrated labels and integrated cards quickly and accurately with the Specialist™ 300. 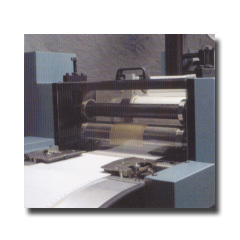 The Specialist™ converts a roll of tape or laminate to a label or card by cutting the material and placing it onto a continuous form at speeds up to 300 FPM (90 m/min.) The form is then die-cut in the area of the patch to produce the label or card. Operator-friendly features provide quick set-up. Smaller cylinder circumferences and bearer-loaded design offer fast size changeovers. Reduced die costs due to smaller magnetic cylinder circumferences. Unique vacuum hole spacing on application cylinder ensures accurate patch placement. Rigid die cut unit cuts through thick laminates and thin tapes. Rugged, industrial design engineered to provide reliable, multi-shift operations. Vacuum cylinder holes, spaced every 1/2" across and around the cylinder provide positive patch placement. 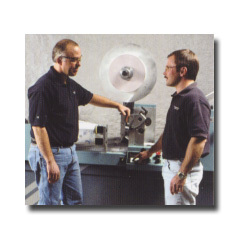 Rugged steel framework and tight cylinder tolerances ensure accurate, consistent die-cutting of thin tapes and thick laminates. 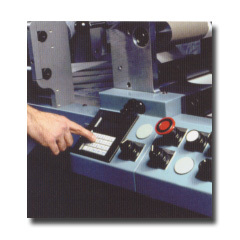 Keypad entry of patch length provides quick set-up and easy operation. 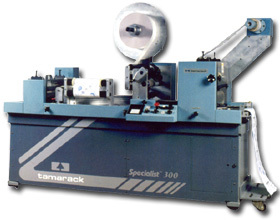 Tamarack's responsive customer service, thorough training programs, and integrated label/card production experience provide Specialist™ customers with the tools to succeed in the integrated market.